Have you encountered a file with MTS extension and you are wondering what kind of format it is? Well here is the answer. MTS is a file extension of Advanced Video Coding (AVCHD). AVCHD is a high definition format often created in Camcorders such Panasonic and Sony. Whereas WMV is one of the best formats regarded as the default format of Windows, in other words, any Windows of any genre supports WMV format. Therefore, people prefer converting MTS to WMV in many cases. Generally, there're mainly 3 reasons causing people consider MTS to WMV conversion. You want to play MTS on your Android phone or iOS phone, which will force you to convert them to standard video, formats like WMV, MOV or AVI. You may want to minimize disk space usage. WMV is a compressed format that occupies less space compared to HD MTS file. 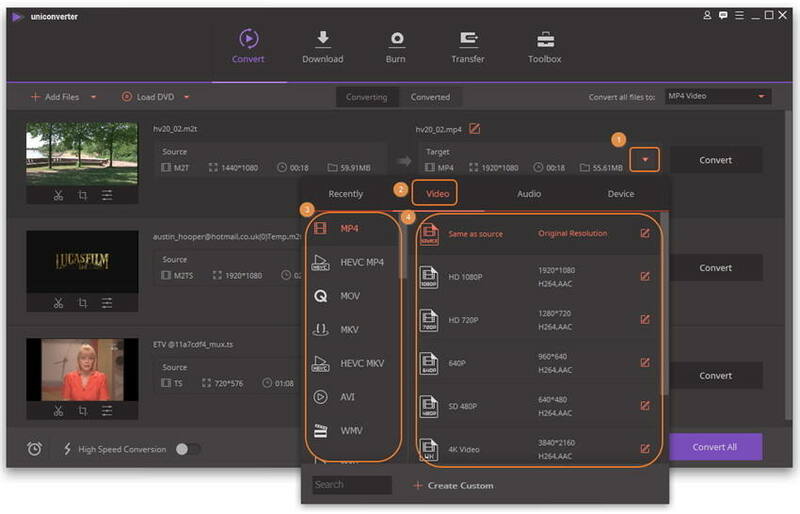 WMV format is compatible with several media players, mobile devices, and browsers compared to MTS files, which are only limited to camcorders and a few media players. 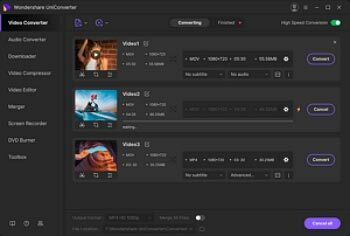 Without further ado, we'd like to recommend Wondershare UniConverter (originally Wondershare Video Converter Ultimate), a professional video converter that combines video converter, online video downloader, DVD burner, video streamer and more. The related process is very easy to follow and the user needs to make sure that the best is provided to the system by following the steps below. With the inception of windows mobile devices the advantages and the usability of the format has also increased a lot and for the same reason it is also to be noted that the user will not only get the best results in this regard but will also make sure that the files are played without any delay and issue. The Wav being a multimedia format makes sure that the user gets the best results and the quality is never compromised. Step 1 The user needs to install Wondershare UniConverter (originally Wondershare Video Converter Ultimate) on the computer first, make sure to download the right version via the download button above. Launch it after installation. Step 2 Click Add Files in the upper-left side to add the files you want to convert. You can add several files in one go as the converter supports batch conversion. Step 3 Click the icon from Target section to expand the output format list, click Video tab and choose WMV from the left side bar, and then select the video resolution in the right to confirm the output format. Step 4 Hit the Convert button at the lower-right bottom of the software window to start converting MTS to WMV audio codec. Immediately, you can see the purple conversion progress bar, and the program will finish the conversion in a short time. After that, you can switch to Converted tab to locate the converted audio file in your computer. Moreover, WMV takes less space as compared to MTS and M2TS, which is widely in use and regared as the preferred format. Been used to upload songs and videos to YouTube also shows the extensive usage and the popularity of WMV. So grab your video and convert it to WMV right away! Zamzar is an online MTS to WMV converter that offers you quick and free conversions. It is user-friendly and only takes a few steps to convert the files. However, you cannot upload a file that exceeds 100MB. Follow these baby steps and convert your MTS to WMV. Step 1. Go to Zamzar website and click on Choose Files file button. This will take you to your computers local drive. Alternatively, you drag and drop the MTS file or download it online by pasting the MTS URL link. Step 2. Once the MTS File has been uploaded to Zamzar MTS converter you can now choose the output format. 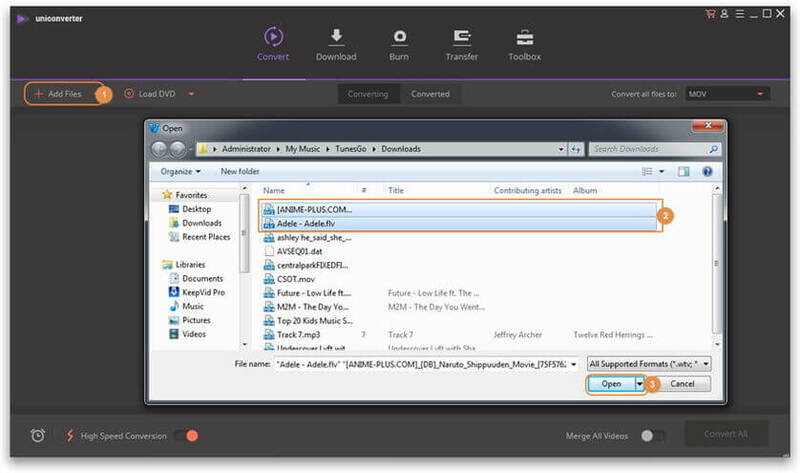 Click on the output icon and scroll down to video formats and select WMV format. Step 3. After that, you will have to provide an email address where the converted file will be sent. Enter the correct email address and then tick the agreement button. 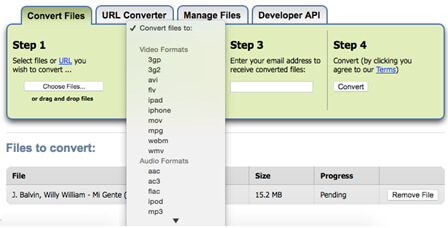 From there, click on Convert, and Zamzar will begin to convert your MTS file. Once the file has been converted, you will receive a notification. Open your email and download the WMV file.